Have you locked in 2013 prices? This is the first of several anticipated posts to stimulate discussion of price risk management strategies. Initially, let’s stay focused on one crop and one season. Later, we can expand the focus of the discussion. So let’s start with pricing the 2013 corn crop. If you have not locked in prices for 100% of the expected 2013 crop, you are a cash speculator! That may be the winning strategy when the marketing year is over, but it looks unlikely at the moment. The headline in FarmWeek, dated 15 April 2013, reads “More bearish news for the crop markets.” Combine the underlying basis for that headline with a very simple technical analysis method that indicates that the trend is down, and the current price risk appears to be to the down side. Cash speculation at this point does not appear to be the correct price risk management approach. Let’s be clear. I can write a scenario for corn prices to rally, perhaps as high as $9.00-9.50. But I can also write a scenario for the prices to fall to $4.00-4.50. The reality is that none of us can accurately predict the conditions which will produce either of those results. Perhaps we could do a little better than a 50:50 guess of which way the market will move, but that means that if you are going to manage the price risk, you must have a strategy in place in case the market goes up and another one in case the market goes down. By all accounts, that is a very expensive process. Let’s strip away the GUESSING and HOPING, and focus on KNOWING which way the market is headed. The point of Selective Hedging is to find a method which can assist in deciding whether the major trend is up or down. There are many quantitative technical analysis methods available to help do that, but beginners want something that is understandable and practical. One example is a simple moving average crossover. For starters, one might use 5 days and 35 days. When the 5 day average crosses down through the 35 days average, it is a sell signal. At the bottom, when the 5 day average crosses up through the 35 day average, it is a buy signal. Pull up your own charts and have a look. For all practical purposes, the 5 day average cut down through the 35 day average last September, and the major trend has been down since. Yes, the 5 day has crossed up through the 35 day average a few times since, but with a little additional analysis, one can easily conclude that the major trend is down. You can talk about all the things that could happen, but as long as the 5 day average stays below the 35 day average, I don’t have to read news reports to know those things aren’t happening. Please note that the 5 day average has turned up (as of this posting), and may soon signal a near term rally. Now, it is entirely possible that there will be a rally during the marketing year. As surely as the 5 & 35 day crossover is telling us that the trend is down, it will tell us when the trend has turned up. At that point, the essence of Selective Hedging is that you must decide if you want to lift your price protection to benefit from the rally, or use counter measures such as buying calls or futures contracts. Please note that the 5 day average has turned up (as of this posting), and may soon cross the 35 day average to signal a near term rally. How serious is it if you continue as a cash speculator and the price falls below $5.00? Only you can decide, but I hope you will begin to monitor some simple technical analysis method to decide for yourself whether you can determine if the price risk is up or down. Please feel free to post questions and comments on the Discussion page. 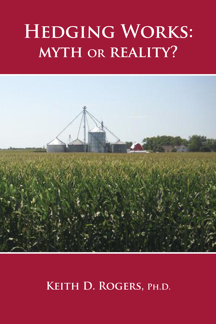 HEDGING WORKS: Myth or Reality? was written to educate, motivate, and challenge agricultural producers to be better price risk managers. It is written for beginners, but contains material which will challenge the most experienced marketers. HEDGING WORKS is based on the author's relatively unique combination of academic career and practical experience.